The nor'easter that blew in today is our second winter storm of the season. The season is actually still technically fall, I guess, since winter doesn't officially start until next week. In the autumn, every warm day feels like a gift. Here on the hill, we have not yet had frost, and although I am no longer watering the garden, as we have instituted conservation measures because of the lack of September rain, it continues to produce some tomatoes, peppers, and eggplant. Whatever we aren't growing is easy to get from the farmers' market, but every eggplant also feels like a gift. This is the perfect time to make ratatouille, while we still can, and on a day when the comfort of a slow-cooked stew will hit the spot. Saturday is forecast to be such a day, chilly and wet. As soon as we get home, I'll turn on the oven and get to chopping. My recipe - really this one's just a template, too - is inspired by the wonderful writer, adventurer, and practiced palate MFK Fisher. If you haven't yet, read Long Ago in France. You can start it while the ratatouille cooks, instead of doing something fatalistic and useful like the storm windows. “The first ingredients were and still are eggplant and onions, garlic, green peppers, red peppers, plenty of ripe peeled tomatoes and some good olive oil. Proportions are impossible to fix firmly, since everything changes in size and flavor, but perhaps there should be three parts of eggplant to two of tomatoes and one each of the peppers and the onions and garlic. I really cannot say. These are from the early summer, in a sweet moment on the hill. The whities, having a time. Vervain is on the left, Buttons front and center, and little Bluebell on the right. Friday Recipe: Stuff Flowers with Cheese! Cotton Hill Road is more than just your average thoroughfare. Schoharie County Route 66 is a steep and winding climb, treacherous in the winter; the location of thousands of acres of state forest; home to a hardscrabble mix of Sloughters and newcomers, with some rarely-seen weekenders; and these days, quite a culinary destination. We have our resident brewer (OK, the brewery is in town, but we were the beneficiaries of many a practice batch), Justin at Green Wolf Brewery, we the cheesemakers, and wonderful organic vegetables at The Farm on Cotton Hill. Jim and Greg are the farmers, and Jim and I got together yesterday to celebrate the end of summer by stuffing cheese into flowers and frying them. 1. Harvest the flowers in the middle of a sunny day, when they are open. Use them right away, or keep them in a cool place to use later. 2. Gather your ingredients: flour and a couple eggs for dredging, some good soft fresh goat cheese and anchovies for stuffing, and olive oil for frying. Flowers! We will eat you! Got veggies? If you have a garden or a CSA share, I'll bet you do! At the farmers' market, eggplants, zucchinis, tomatoes, garlic, and onions abound. How about roasting them in the oven while you play outside, then tossing them with pasta when you're ready to chow down? 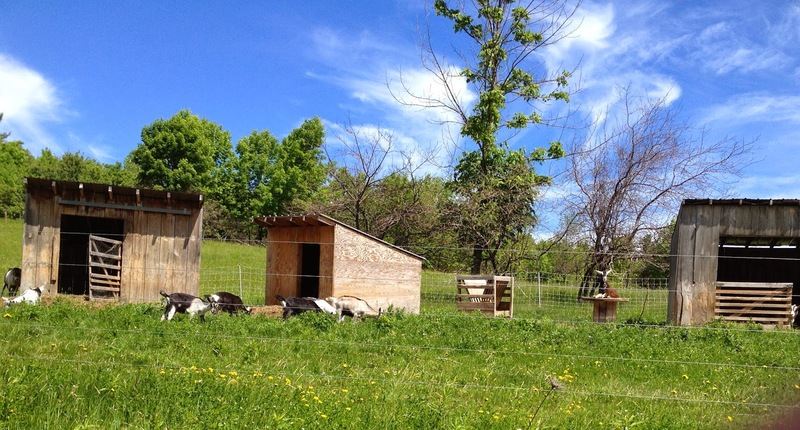 There are a few new goat faces here at Cotton Hill Creamery. They are very little, so we won't be milking them anytime real soon. They've got some growing to do. Here's Nettle and Olive (with good old Buttons trying to photobomb in the background). Noisy Nettle and Black Olive stick together. This is good, because it allows me to distinguish Olive from Jem, who has one tiny white spot on her left side where Olive doesn't. Otherwise the two are identical. Here's Raindrops. She is a yearling, actually, but she is very tiny. She has flashy markings and a pretty smile. Little Daisy just came to our farm this week. She is sweet sweet sweet. After a few days in our pasture, she looks like a basketball resting on four popsicle sticks. She wants to follow me around all the time. Farmer Fin won't let me bring her in the house though. And here they are all together. With Buttons, of course. Everyone who cooks has a different approach to making dinner. Some people follow recipes, some have a repertoire of dishes that they rotate, and others just improvise based on what is in the fridge or garden. Most of us probably use a combination of these approaches. Myself, I love experimenting with new recipes, but most of the time, I play it by ear. I don't think I ever make the same thing with the same ingredients twice, partly because I'm too disorganized to plan and shop according to plan, and partly because I love food and gardening and farmers' markets. I shop for groceries the way some women shop for clothes: obsessively, impulsively, and aesthetically. Also, I like leftovers. It's a great relief to have a good lunch for the next day in the fridge before you go to bed at night. This is one of the main reasons why a fritatta is my go-to last minute meal. Here's what I do; you can try it too. Dinner is served. Now with product placement. I can't imagine doing this in anything but a cast iron pan. Mine is 10"; I have to use both hands to pick it up. If yours is a little smaller, you could use fewer eggs, or just cook it longer. 1. Preheat your cast iron pan. If you want to caramelize onions, remember to keep the heat medium low. If you're in a hurry, crank it and get ready to stir. 2. 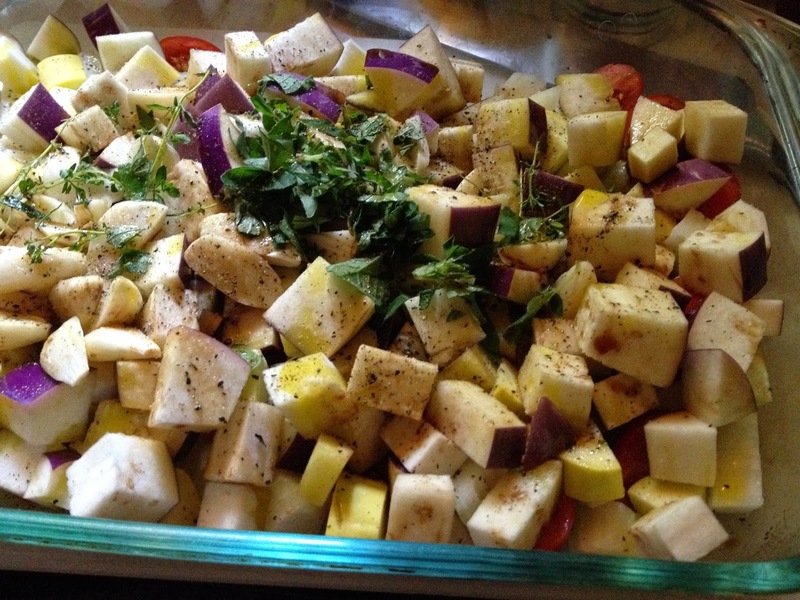 When the pan reaches your desired heat, cook your veggies/meats in plenty of butter or oil. 3. Meanwhile, scramble the eggs with a pinch of salt and a generous grind of black pepper. When your veggies are cooked, pour in the eggs. Don't stir, just even it out a bit. Turn the heat to low. 4. Wait a few minutes, and add the cheese evenly. It's ok if it sticks up out of the egg mixture a bit; that part will brown nicely under the broiler. 5. Let the eggs cook until the bottom is set. The edges will get less wiggly, but the middle will still be very liquid. Preheat the broiler while the eggs cook. 6. When the bottom and edges are set, put the pan under the broiler for 4-8 minutes, until the fritatta is golden brown, slightly puffed, and feels firm to the touch. Let it cool for a couple minutes, and cut into 6 or 8 slices. Serve with a salad and some good bread. If you're a small family, the leftovers make a great sandwich for breakfast or lunch. You get the idea. Maybe you could put your favorite combination in the comments. Unbeknownst to us, one of the red hens somehow slipped away, laid an egg, and sat on it for three weeks until it hatched. Celeste is a mommy! She's a good one, too. It's hard to even get a picture of her chick; as soon as I get close, she spirits it away under her wing or into some tall grass. Chickie Baby follows its mother around all day, eating bugs and chirping constantly. Yesterday Celeste brought it up to the chicken yard and showed it how to eat chicken feed, like a chicken. Chickie Baby is adorable, but its a hard world for a little chick. I hope the rooster is looking out for his baby. I also hope the baby turns out to be a hen. The triplets are three weeks old and summer is in full swing. It's a good time for adventures. Last week, they went out in the pasture with their herd for the first time. The big world is a little overwhelming when one is so very small, but there is so much fun to be had. Also, the kids made a new friend. Bird, the Cotton Hill farm dog, has been accompanying us to the night-time feeding lately. He is not immune to the charms of soft little animals. In fact, he likes to lick their ears. Look at that vicious pit bull! The littles were scared at first, but now they like to smell him, too. It's a peaceable kingdom up here on the hill. Lots of parties in the summertime! Pair fresh goat cheese with summer produce for a quick, tasty appetizer to bring to a barbecue or garden soirée. If you have a garden or a friend with a garden, or go to your local farmers' market, you are probably seeing a lot of garlic scapes lately. A scape is the top, or stem, of the garlic plant. They are curly and whimsical! There were tons of scapes at our market (http://www.delmarmarket.org/) last week, and they will probably be there again tomorrow. Combined with spinach, arugula, or a leafy green herb, like basil or parsley, garlic scapes make wonderful pesto. You can see my arugula hiding beneath the scapes there. For the pesto, fill the bowl of a food processor with a bunch of scapes and your greens. Add some good olive oil and process for about a minute, until it all begins to come together. Then, add a scant cup of toasted nuts or seeds. If you are a literalist, you should use pine nuts. If you can't afford them, pumpkin seeds work nicely, as do almonds or walnuts. Save a handful for a garnish! Process until a sort of paste forms. Be sure to leave some chunky bits in there; texture is good! Then, spread four ounces or so of good fresh goat cheese on the bottom of a dish. I used this pie plate because it's glass, but you probably have something prettier, don't you! Spread the pesto on top of the goat cheese, just enough to cover. Those garlic scapes are pungent, and you don't want to overwhelm! Then, sprinkle the toasted nuts on top. Voilá! Grab some crackers and head out. Don't worry if you're fashionably late; it's summer, and you have goat cheese. Have fun! In case you were wondering, little Mr. Kitten is hanging in there, thriving even. At two weeks old, he has probably doubled in size - he's at least three pounds now. Mr. Kitten loves milk! He has an overbite! And knobby knees! He mews! Go, Mr. Kitten, go. Monday marked the end of the 2014 kidding season at the Cotton Hill farmstead. It's unusually late for it, but the lovely Vervain just refused to be bred in a timely manner back in the fall. Better late than never, I suppose. I was out for the evening, but Farmer Fin reported that when he went up to fill the goats' water after milking, there was Vervain with three tiny babies. The littlest one is no bigger than three pounds. We call him Mr. Kitten. I'm trying not to get too attached. One of the black ones is a girl, though. For a sense of the tinyness, look how big my hand looks compared to their heads! It feels kind of peculiar to have tiny babies again. The bigger littles had to grow up fast so we could put the new ones in the nursery pen without getting squashed. They seem to be enjoying life with the herd, although they are not thrilled at having gone down to one bottle a day. Speaking of milk, Vervain is a chip off the old block: like her mother Violet, she makes a remarkable amount of milk. Welcome to the life of a working goat, Vervain! A snapshot from the garden. Spring is lovely here on Cotton Hill. After the piglet escape fiasco of 2013 (see http://cottonhillfarm.blogspot.com/2013/06/the-swine-are-fine.html), I was trepidatious about getting new piglets this year. 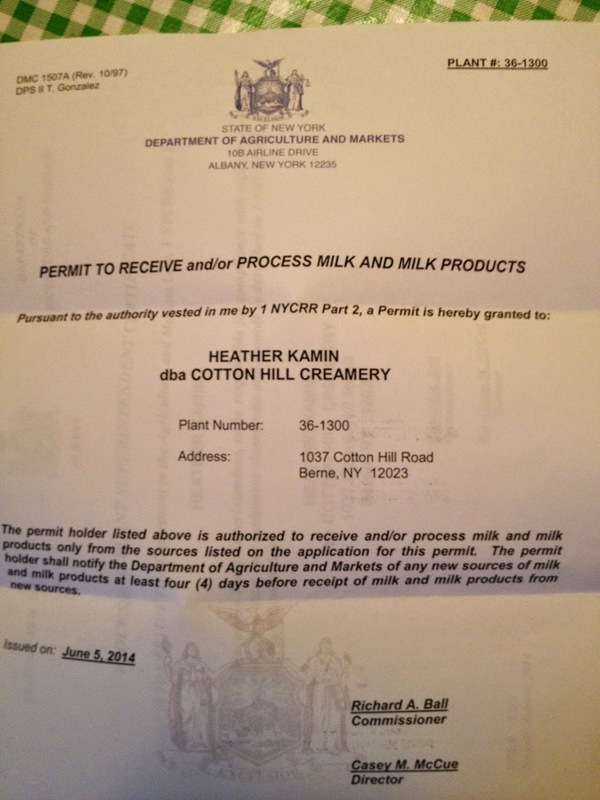 But in our imminent incarnation as a licensed dairy, we'll have a lot of whey, and someone's got to consume it. On May 5th, our friend Farmer Josh delivered two tiny piglets. We drove them up the hill, and Farmer Fin dropped them into their pen, securely ensconced in brand-new, fully charged electric netting. They sniffed at the fence, registered a bit of pain, and proceeded under it, and then under the lowest high tensile wire on the pasture's perimeter fence. We stood there wincing, and the piggies were gone. After a pathetic hour of searching the woods, Josh advised us to leave some hay for bedding and a few piles of dried corn around the area where we wanted them to be, and he took off. My hopes for their return were not high. A few days later, a neighbor in a pickup truck pulled in to the drive while I was milking in the shed, and informed me that he'd seen two little piglets on the road. Great! They were back. Two weeks of intermittent piglet sightings followed, and then last week, they took up residence in the apple tree grove right behind the house. They seemed to really enjoy milk and hanging out with chickens. The pigs followed our (also unreliably fenced, bad farming!) flock around as if that were a good idea; they trampled the chicken fence to roll in gross chicken mud and nibble layer pellets, and trailed the chickens all over the yard. Farmer Fin and I are terribly busy these days. The pigs were overturning buckets, breaking garden beds, and rooting up lawn in their obsession with the chickens, but we really couldn't get to it until the weekend. Finally, on Saturday, May 24th, nearly three weeks after their escape, we captured them. It took a whole morning and then some, but thanks to Farmer Fin's catlike reflexes and our slightly superior intelligence, Kim and Kanye are finally within the fence line. They seem pretty comfortable in their hilltop pig pen. Hopefully they'll stay for a while. Now we have several months to figure out a more secure piglet home for next spring. The first (and second) of the kids were born in early April. Then there was a two-week lag, and then the rest came fast and furious: five does kidded in one week. We're up to 11 kids now, all hungry and growing fast. and make new friends. They're learning all kinds of new skills, like grazing and drinking water. Many, many more baby goat pics, and a dramatic story, after the jump. The first kids of 2014, a buck and a doe, were born to Juniper last Tuesday, April 8. We made a little nursery in the barn, and they are growing fast. These pictures are from their first few days. It's spring! It's spring! Crocuses and honeybees. Sunday and Monday were beautiful and in the 70s. I planted seeds and got a sunburn. Then last night we got three inches of snow. It was 65° for morning chores yesterday; today it was 20° and I had to apologize to Junie for my cold hands when I milked her. I guess April really is cruel. One of these days, though, spring will come to stay. Violet and Pansy are twin sisters (goats almost always deliver twins). Pansy is a little bigger than her sister, and nearly as pretty, but she has one trait that prevents her from being the queen: her temperament. Pansy is neurotic. Physically, a fine specimen, but she is kind of crazy. You can see it in her eyes. When we went to pick up our first caprine additions to the farmstead, we decided to give our goats botanical names. Four years later, we may abandon this practice; it's getting a little confusing with a dozen does named after plants. The first two, we named according to personality: Violet (as in shrinking), and Pansy, because they were both so shy and skittish. Unlike Violet, Pansy did not see the advantage in being friends with the people. She wouldn't let anyone near her. She was like a deer. A deer with Houdini-like evasion skills. More than once, this large-framed girl managed to launch herself out of the big shed, over the four-foot-high gate, through a three-foot gap between the top of the gate and the ceiling. Honestly, I was ready to give up on her, but where could she go? I feared for her fate if we sold her. I was frustrated, but Farmer Fin was astoundingly patient with her. At vaccination time, he would sit on the milking stand with a scoop of sweet grain for many minutes as she eyed him cautiously, approaching only to flee to the corner of the shed (or out the gate) again and again. Eventually, he would lure her up there, and she was surprisingly pliant once she was locked in and munching on grain. Over and over Fin and Pansy repeated variations of this theme. Sometimes he'd just sit and wait for her curiosity to get the better of her. She'd come close warily, but eventually, she began to allow him to scratch her back or stroke her head. Slowly but surely, Pansy was becoming domesticated. In the fall of 2011 we were even able to get her into the truck to be bred, and she had her first kids the next spring. Pansy is still quite suspicious of humans. When we bring strangers into the goat yard, she shies away, but if it's just us, she always comes over for a little affection. So far, we have let the moms raise their kids (this year, since we are transitioning into being a business, we'll be bottle-feeding), and Pansy is a very protective mother. Both of her daughters, Petunia and Peony, inherited their mother's craziness, to some degree. Petunia, though, as a young adult, has absorbed the culture of the farm, and has become cooperative and fairly friendly; we expect little Peony will too. Pansy has taught us a lot about patience and love. She is a connection to the wildness of these creatures with whom we live and work. Whenever I see a family of deer grazing in a field, I think of her, and how adaptable animals can be. Goats are good fun and great company. Each one of our goats has a very distinctive personality (goatality? ), and I suddenly realize, dear readers, that you and the goats have never been properly introduced. This is a glaring oversight for which I apologize, and which I will try to correct in a series of profiles. We begin with Violet. Lovely, intelligent, friendly, and assertive, Violet is the herd queen, and one of the first two goats who came to live on our farm. Here she is with her sister Pansy (the subject of the next profile) soon after coming to live here in the spring of 2010. When we adopted Violet and Pansy, they had not been socialized much. They were both really scared of people, but Violet had a natural curiosity that led her closer and closer to us. Soon, she discovered that she loved being petted, and approached us for a nice head rub whenever we came up to the pasture.